(CNN) -- North Korea's reclusive leader appeared in public Wednesday for the first time in months to commemorate the 15th anniversary of his father's death. 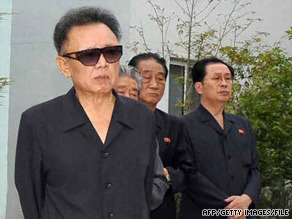 Kim Jong Il, seen in an undated state-issued photo, has made only two public appearances since August. His recent health problems and long absence from public functions have prompted speculation on whether he was ready to groom an heir to the world's only communist dynasty. Wednesday's service was held to honor Kim Il Sung, who died July 8, 1994 -- paving the way for Kim Jong Il's rise to power. The elder Kim, known as "Great Leader," is still considered to be the country's "eternal president." Kim Jong Il is called "Dear Leader." The rules governing transfer of power in the secretive communist nation are unclear, but it is widely believed that Kim Jong Il's youngest son, Kim Jong Un, will succeed him. In April, the North Korean leader named Kim Jong Un and brother-in-law Chang Sung Taek to the country's powerful National Defense Commission. Chang, who is married to Kim Jong Il's sister, has effectively run the country after the leader's health problems, according to Time magazine. Chang is "the bridge from Kim Jong Il to Kim Jong Un," according to Baek Seung Joo, who watches North Korea at the Korea Institute for Defense Analysis and spoke to Time magazine last month.